No, I’m not talking about the fact that a major bank is named Fifth Third Bank. (As a friend said, why would you trust your money to a bank that seems not to understand fractions?) I’m talking about Fifth Third Bancorp. v. Dudenhoeffer, which was heard by the Supreme Court last week. The plaintiffs in Fifth Third were former employees who were participants in the company’s defined contribution retirement plan. 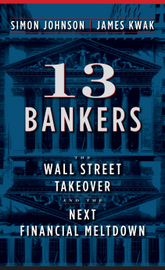 One of the plan’s investment options was company stock, and the employees put some of their money in company stock. (Most important lesson here: don’t invest a significant portion of your retirement assets in your company’s stock. Remember Enron? Anyway, back to our story.) As you probably guessed, Fifth Third’s stock price fell by 74% from 2007 to 2009—this is a bank, you know—so the plaintiffs lost money in their retirement accounts. The claim (I’m looking at the 6th Circuit opinion) is that the people running the retirement plan knew or should have known that Fifth Third stock was overvalued in 2007, and they breached their fiduciary duty to plan participants by continuing to offer company stock as an investment option and by failing to sell the company stock that was owned by the plan. The suit was dismissed in the district court for failure to state a claim, so on review the courts are supposed to accept all the plaintiffs’ allegations as correct. 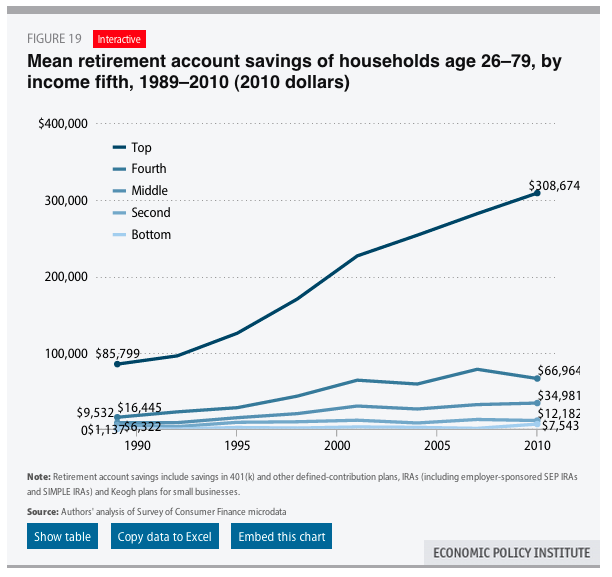 The Economic Policy Institute put out a series of charts detailing inequality in retirement savings across several different demographic characteristics. The most obvious picture is that the shift to 401(k) plans has produced vast increases in retirement inequality across income groups.